Alex Bowman is in the 16th and final spot in the Monster Energy NASCAR Cup Series Playoffs points entering the Big Machine Vodka 400 at the Brickyard Powered by Florida Georgia Line, 68 points ahead of 17th place Ricky Stenhouse Jr. This race is the last event in the regular season before the NASCAR Playoffs start next Sunday at Las Vegas Motor Speedway. That gap makes it impossible for Stenhouse to pass Bowman for the final spot in the Playoffs unless he wins, as a victory immediately qualifies a driver for the postseason. There are three former Brickyard winners below the 16th-place cut who could still earn a postseason berth with a victory today: Ryan Newman (2013), Paul Menard (2011) and Jamie McMurray (2010). 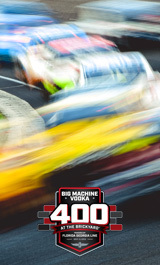 Kasey Kahne is missing the Big Machine Vodka 400 at the Brickyard Powered by Florida Georgia Line due to continued problems with heat exhaustion, so that guarantees there will not be a repeat winner of this race. Winning back-to-back at the Brickyard is a rarity, anyways. Only two drivers have achieved the feat – Jimmie Johnson in 2008-09 and Kyle Busch in 2015-16. Only four pole sitters have won the Big Machine Vodka 400 at the Brickyard Powered by Florida Georgia Line – Kevin Harvick (2003), Jimmie Johnson (2008), Ryan Newman (2013) and Kyle Busch (2016). Busch is starting from the pole today after the starting lineup was set by owner points, per the NASCAR Rule Book, due to the cancellation of qualifying because of rain. Busch could become the first driver to win this race twice from the top spot. Looking for a pre-race favorite? Jimmie Johnson has won this event four times, but the numbers favor 2003 Brickyard winner Kevin Harvick. “Happy” is the only driver with at least five starts in this race who has an average finish better than 10th. Harvick’s average finish is 9.706 in 17 career Brickyard starts. Johnson’s average finish in 16 starts is 15.375. Two-time Brickyard winner Kyle Busch is second on the average Brickyard finish list among veteran starters, at 10.923 in 13 starts. Ask any Cup Series driver, and they’ll tell you the Indianapolis Motor Speedway is one of the toughest tracks to drive due to its relatively flat, 9-degree banking in the corners and four distinct turns. Experience matters at IMS, and that’s proven in the list of winners. No Cup Series rookie ever has won this race. That doesn’t bode well for William Byron and Bubba Wallace, the two Cup Series rookies in the field today. But Byron does have winning experience as an IMS first-timer, as he captured the Lilly Diabetes 250 last year as a NASCAR Xfinity Series rookie. Only one driver – veteran J.J. Yeley – is scheduled to compete in all three races this week at IMS – the Driven2SaveLives BC39 presented by NOS Energy Drink USAC P1 Insurance Midget National Championship race last Thursday night at The Dirt Track at IMS, and today’s race and the Lilly Diabetes 250 on Monday on the IMS oval. Yeley didn’t qualify for the feature in the BC39. He will start 35th today in the No. 23 Toyota and 27th in the No. 38 RSS Racing Chevrolet on Monday in the NASCAR Xfinity Series race.